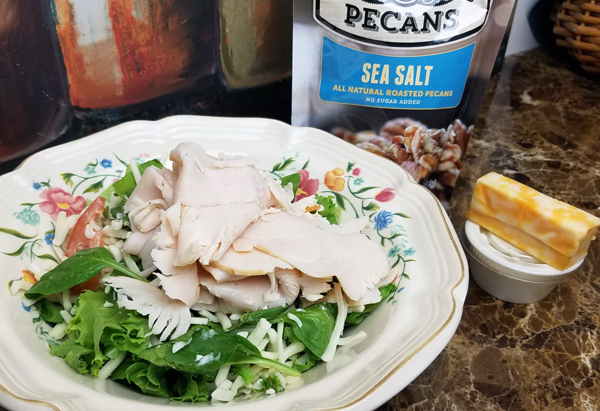 If you’re participating in the Summer Low Carb Challenge it’s time for the Week 7 Weigh-In in our private Facebook group, or leave a comment here on this post with your total pounds lost since June 25th. I had a very relaxed weekend with my low carb meals, but my food diaries – my macros and carb counts – still came out pretty good. 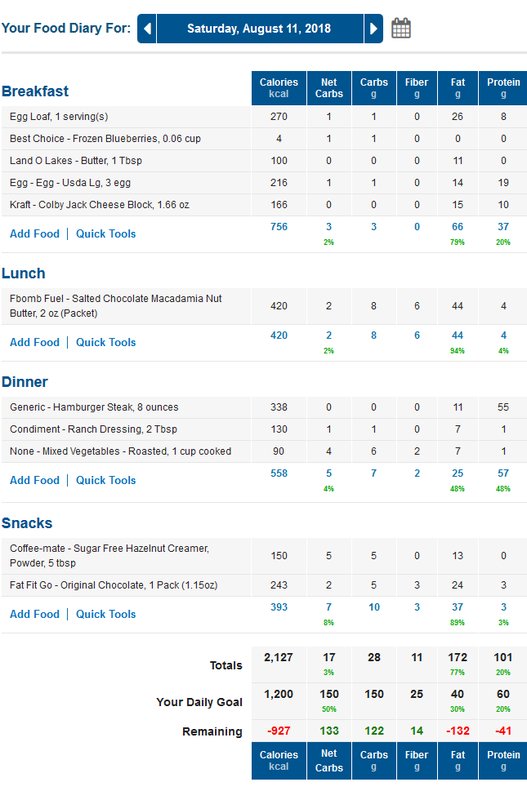 Below are four full days of MyFitnessPal Logs and a photo tour of all my meals each day. As you’ll see it was all super easy meals and delicious comfort foods the last few days! I got up on Friday morning and made another Blueberry Egg Loaf. I had a NUSH Foods low carb peanut butter snack cake with coffee earlier that morning. 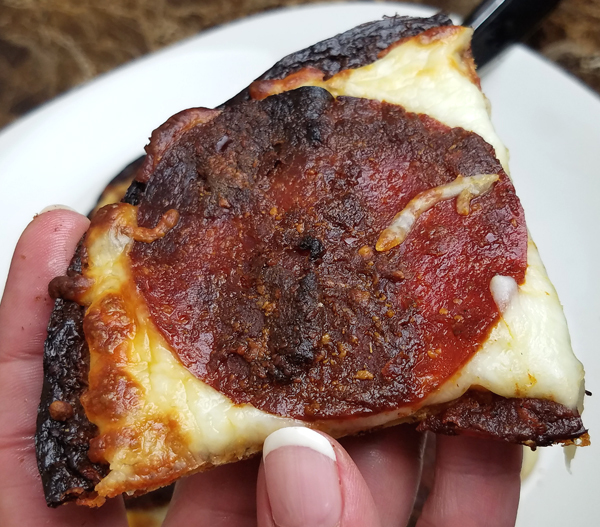 Then for dinner I made the Keto Pepperoni Pizza that I mentioned in my last post, with the Outer Aisle Gourmet Cauliflower Crust and the Pepperoni Pizza Jerky. I finished the last serving of Blueberry Egg Loaf for breakfast, just plain with coffee. It’s better fried in butter, but it’s nice to have something to just grab & eat first thing in the morning! 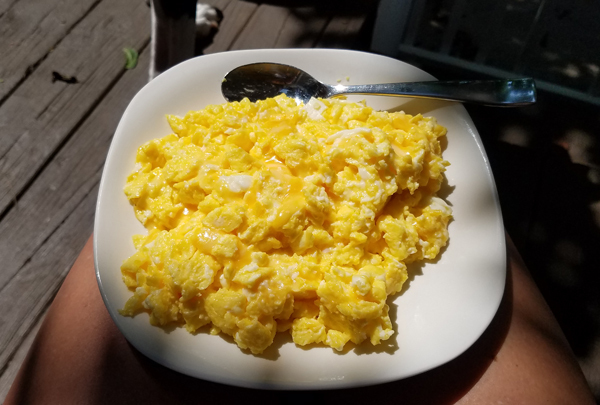 By late morning I made some cheesy eggs: 3 eggs scrambled with colby jack cheese. 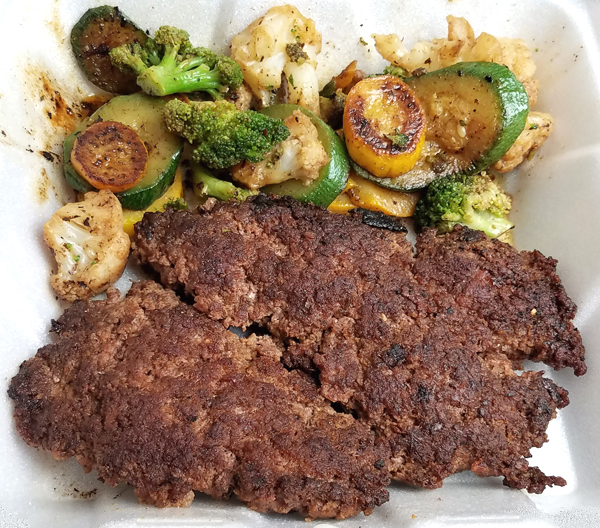 A huge half pound hamburger steak with roasted vegetables. I dipped the meat & veggies in ranch too. Yum! 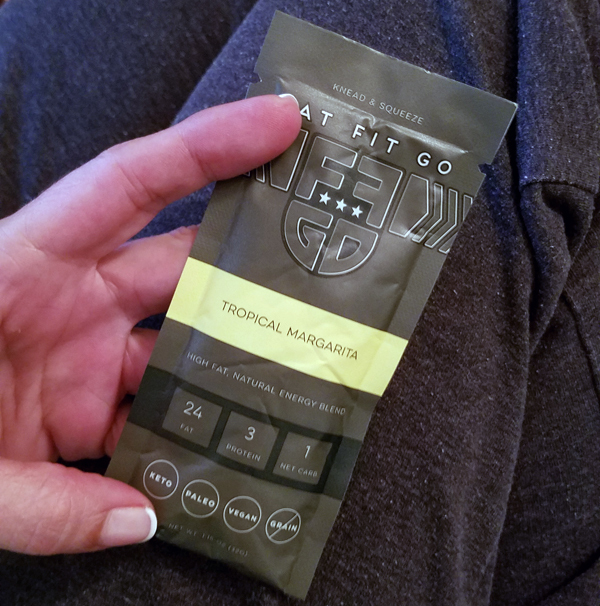 Later that night I had one of the FatFit.Go Tropical Margarita nut butter fat packs too. The “lime nut butter” is odd but strangely addictive lol. 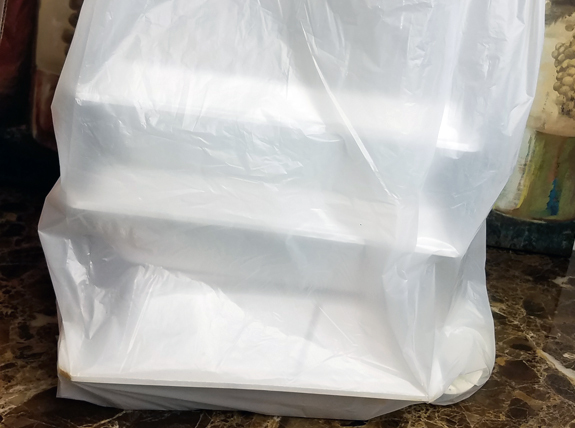 The delivery I got on Saturday night was actually two meals. 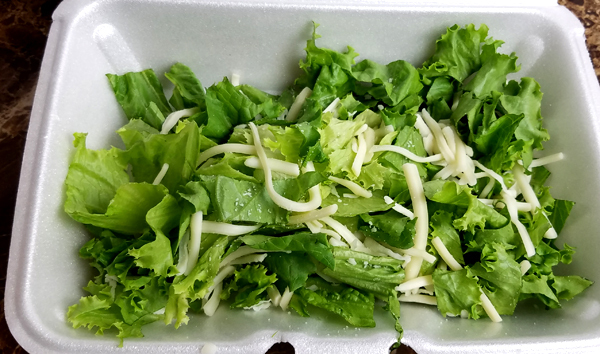 There was a side salad that came with my meal, which is just fresh romaine & mozzarella – a side caesar with no croutons, and ranch on the side instead of caesar dressing (just preference). Anyway, for breakfast on Sunday I combined both into a BIG salad. This is a serving bowl – not a cereal bowl, lol. 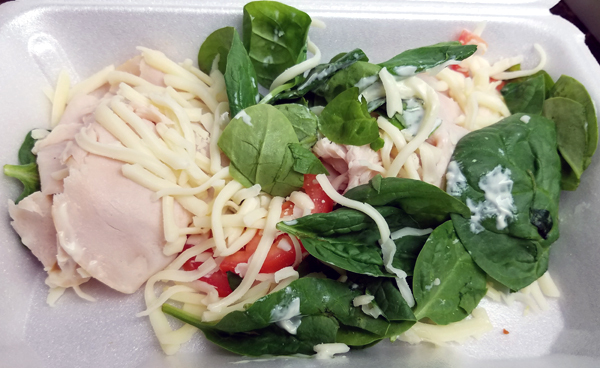 There was lots of romaine, spinach, all the turkey, mozzarella and just a bit of tomato. 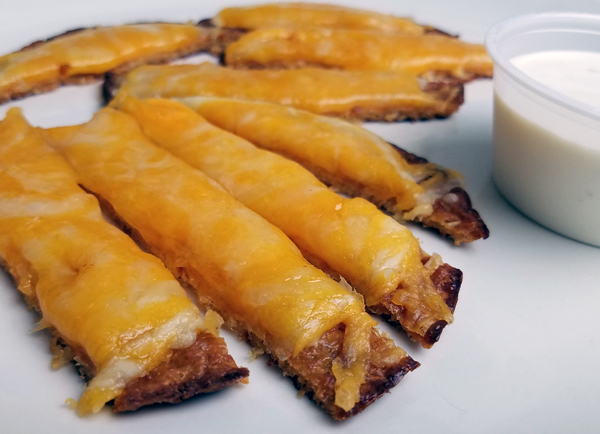 I had the ranch, grabbed the Sea Salt Pecans that came in my Keto Krate this month, and sliced some colby jack cheese off the block. 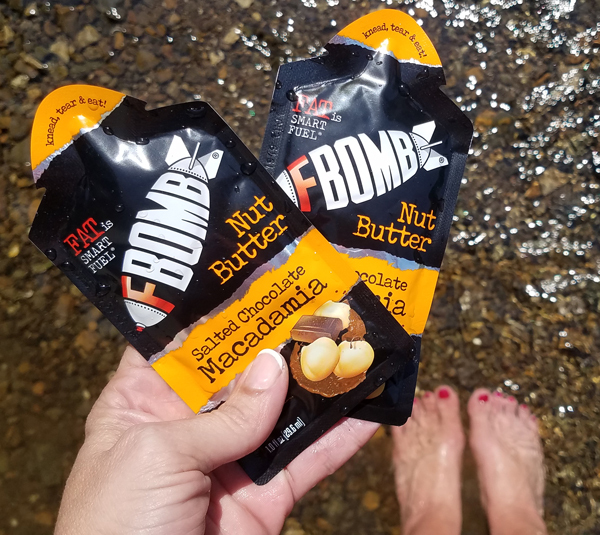 The salad was VERY filling so I ended up having the cheese & Front Porch Pecans for lunch – along with another Tropical Margarita FatFit.GO nut butter packet. 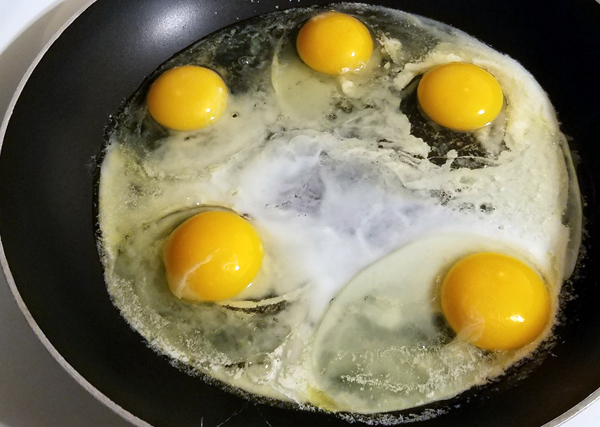 I got up and made a BIG plate of eggs, scrambling FIVE eggs because I knew it was going to be a super busy work day and that would get me through two meals. 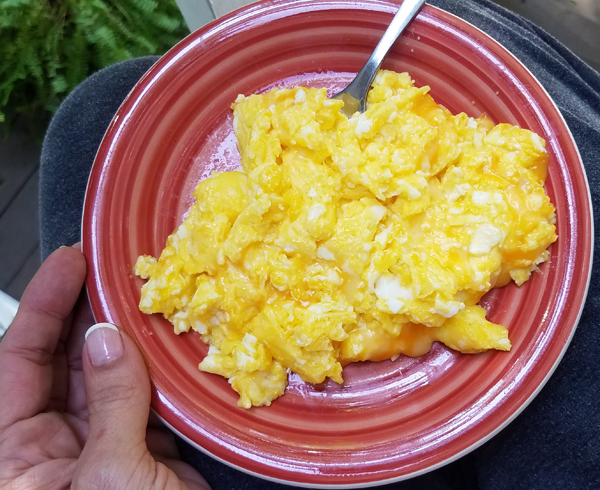 I scrambled them in real butter with colby jack cheese as usual, and ate about 3 eggs for breakfast then finished the rest later. I made them using the Outer Aisle Gourmet Sandwich Thins. Delicious! 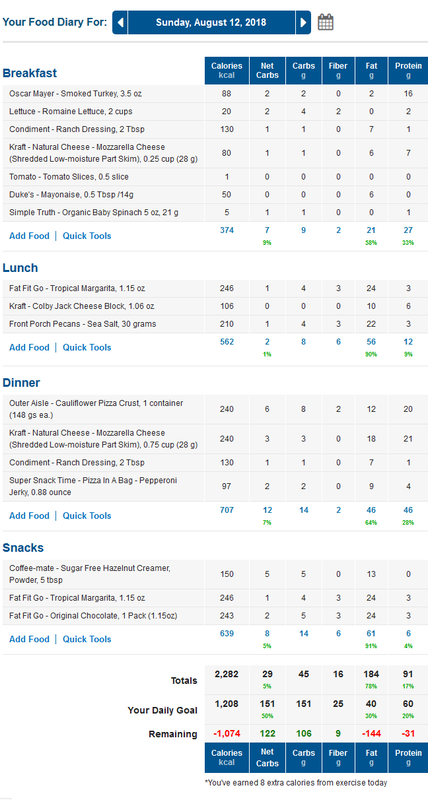 Like I said, I wasn’t even really watching my macros that much over the weekend or for the last few days. And for some reason I was just craving “junk food” like pizza and chocolate and cheese sticks. I’m surprised my net carb counts and macros still came out so reasonable, because I had a very relaxed weekend of simply eating what I wanted when I wanted. Surprised, but pleased! Trying to figure out this Keto thing so I actually see some weight loss. Is there a mistake in the Friday net carbs? I keep adding up to 29 net carbs for the day and MFP is showing 25. That’s it. Thank you. Now back to reading about “not losing weight on LCHF”. I might have to follow your 3 ingredient meal. Hey Aaron 🙂 Start here: http://www.travelinglowcarb.com/7006/macronutrients/ That is a really simple illustration & explanation of what I do. I keep it really simple: 20 net carbs max, 70% fat minimum. How & what are you tracking, and how long have you been doing that consistently? Thank you for all the help. I have been looking at that and have been tracking since July 5th and limiting carbs a few days before that. I lost a lot of weight on Atkins 10+ years ago and was not focused on the fat percentage then. I just ate lots of protein with fat added on (mayo, cheese, etc). This time I have been focused on the 70% fat that you have been mentioning. I seemed to have stalled at that level and just gaining/losing the same 3 pounds for the last two weeks. It most likely is my body taking longer to adjust since I am older and also readjusting itself to the new intake versus the “see food” diet I have been on for a while. I think I was not getting enough protein and finally busted through that level this morning after 8 days of meeting my “protein” needs according to the “calculators”. A new low this morning I have not seen in a few years. Hopefully it continues. That’s actually totally NORMAL during week 2 and/or week 3. 🙂 It happens to all of us! It’s just your body adjusting to the initial weight loss the first week or so. Hi Lynn, I just came back to low carb after having tried it 2 years ago and walking away after a few months. I followed you then and came right back this time 🙂 I notice all of your calorie counts are over the 1200 calories I hear so many say I need to stick to with the 20 net carbs for decent weight loss. My macros are dead on, I stay between 20 and 22 net carbs but my calories are anywhere from 1100 to 1800…thoughts on whether I would lose more if I stuck to 1200 calories??? I am an almost 46 year old, 12 year post hysterectomy, woman who does not weigh, just go by measurents, clothes and photos. I am 45 and post hysterectomy as well. 🙂 I have never counted calories, and I would STARVE on 1200’ish calories a day. 😛 It’s not a calorie deficit diet though, there’s a science to way ketosis works to burn body fat. 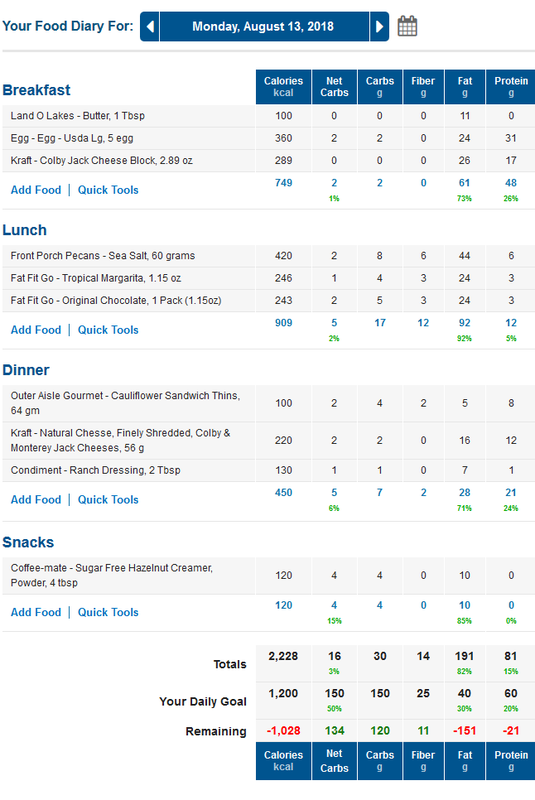 I lost all of my weight keeping it super simple: 20 net carbs max, 70% fat minimum. My weight dropped a pound in that span of a few days too, so no – calories aren’t something I worry over. I’m confused. The net carb goal listed in your diaries above state 150?? Have i missed something? I’m not sure what you’re looking at? The Net Carbs for each day are different, but none of them say 150. The goal is 20 net carbs max and 70% fat minimum – per day. Sometimes I go a little over, but rarely. And even then it’s not by much – and not by enough to knock me out of ketosis. Where are you seeing the 150? I’m going to do a way behind update. Basically, because I haven’t had weight loss in weeks due to constant stress. (still 172.4 started at 174.2) The stress I cannot walk away from so I am happy to be maintaining but I continue to look for a way to reduce the cortisol nutritionally or naturally. I was diagnosed with low thyroid in the spring…the I had the shingles this summer. A new collegiate year is beginning this week. I will be retiring Jan 1 so I can spend time with my husband. He is doing better and is definitely recovering after the sepsis he had last summer. It has taken him 10 months to gain 20 lbs after losing 50. We are quietly waiting for the shoe to drop putting him on dialysis. Which also means things to do to get ready. I said all of that just to let you know of what is going on. I am eating low carb and that handles the physical discomfort I have when I am not eating properly. It is just that the weight loves me so much it wont leave. And I know that cortisol is 95% of the cause. We are good and we are blessed. So I am happy with no weight gain 🙂 Everyone keep on keeping on! I found that being sick this past year really put my weight loss on hold, so that may be the case for you too. Just let your body recover, but stay mindful of what it needs or any way you can feel better – including feeling less stressed. Stress has been a trigger for my weight loss stalls over the years as well. The thing that made a difference recently was exercise. First because it is a natural stress reliever, and also because it releases feel-good chemicals in the body. That’s what finally got me losing again, I think as much because I had an outlet to release tension and anxiety. But also because I was more focused on the FUN that I had and the sense of accomplishment – vs the other things weighing me down. One thing you said really stood out to me: “the weight loves me so much it wont leave.” I don’t meditate, or even know how 🙂 but when I catch myself saying things like that, I turn them around. I’ll do breathing exercises, and say “you’re free to go” or “I release you” or whatever. It sounds hokey but it’s very relaxing, and your brain and body communicate constantly. Anyway, that statement reminded me of an ex I couldn’t get rid of. I moved three times even, lol. 😛 He finally found someone else to harass (whew!). Maybe you can “release your weight” and free it up to someone who struggles to GAIN weight. There are lots of people out there like that, btw – and they are plagued by “skinny shaming” which is so sad. My son was that way, just very lean and constantly teased about it. I’m rambling… it was great to hear from you. 🙂 Wishing you wonderful things!! Thanks for your feedback. 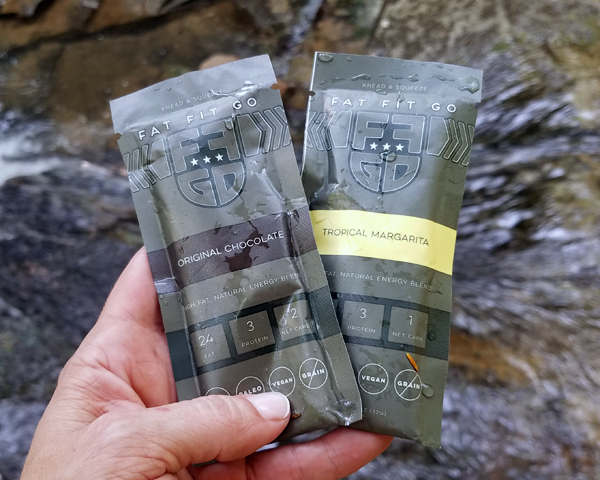 I posted because cortisol is so influential in our weight loss life. I am so excited!!! I only have a half pound till I have gotten rid of 80 pounds!!! I do not want to say I “lost it” because I NEVER want to find it again. but to be honest it hasn’t been 100% because of Keto. at first I went to my doctor who put me on phentermine and I also joined WW it was still hard to lose that first 30 pounds then found out I needed thyroid meds. that helped me with the next 10 then my new doctor increased my thyroid meds and another 20 pounds went baby. but this last 20 was all kept and in a shorter period of time. it’s been a 2 year journey, but this last 20 has only taken 7 weeks. I still have about 30 to goal till I hit my goal, but with Keto it’s been so easy to turn away foods that I know aren’t a good choice for me. when you can make the BEST TASTING blueberry muffins with coconut flour. what go back to wheat? and just 1 muffin satisfies. now that’s amazing!!! I TRUELY LOVE THE LCHF way of eating!!! 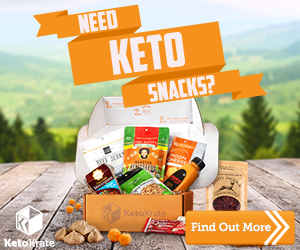 Thanks for your wonderful advice, recipes, and introducing me to KETO KRATE BOXES!! p.s. I think it was the diet soda that was causing most of my pain. quit drinking it and pain dropped considerably, with-in 3 days. and maybe it’s my spelling, LOL OMGoodness!!! I wish you could post more recipes using ingredients found in supermarkets instead of items that have to be specially ordered. Some of the items are expensive. I’m beginning to feel like you’re pushing for these companies. Just my thoughts. Thanks! 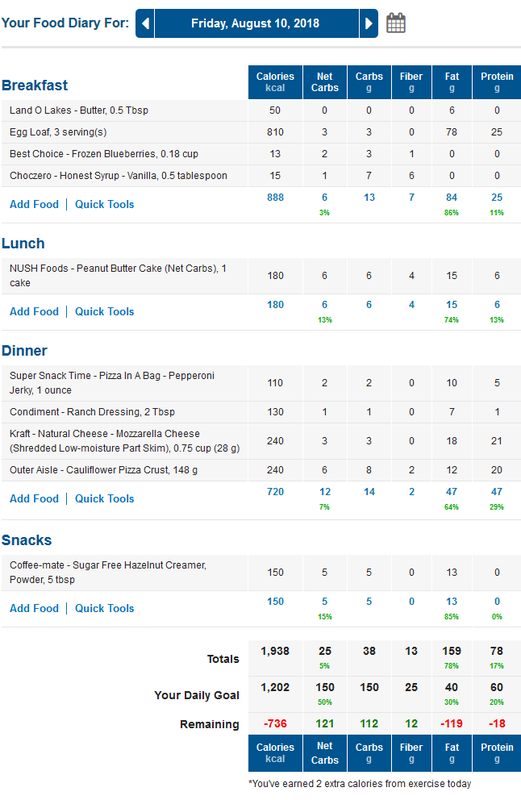 This particular food diary I prefaced with the fact that it was a weekend I felt like having junk food. 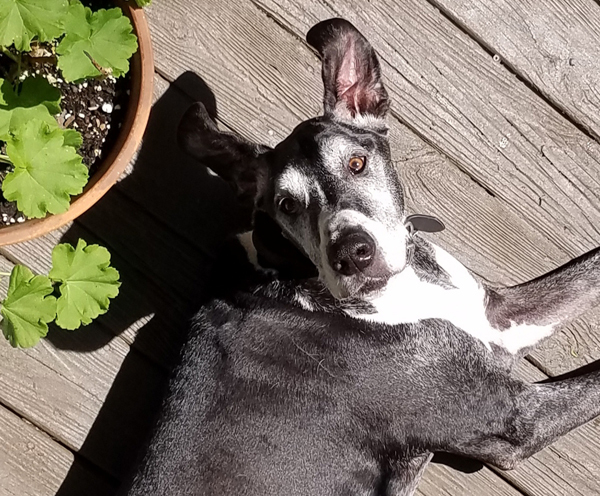 What I didn’t share was that it was also following my senior dog being very ill – I thought for sure I was going to lose him. And a very tough breakup on top of that. I was depressed, tired, sad, and just ate whatever I had on hand. That said, I did make the egg loaf and french toast sticks from simple store bought ingredients: eggs, butter & cream cheese. You can use any sugar free syrup you prefer. Usually I don’t even put syrup on mine at all. 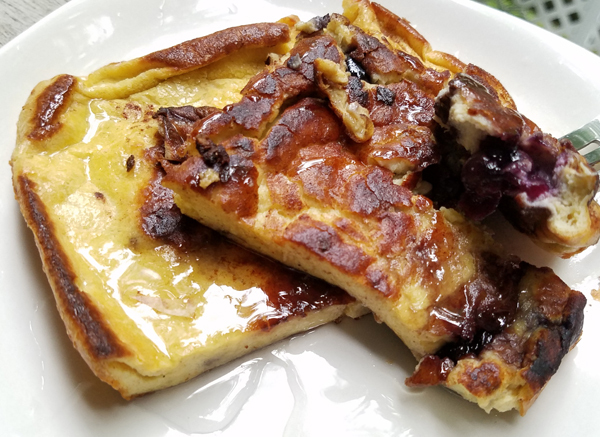 I otherwise had eggs, hamburger steak, roasted vegetables, romaine salad, turkey & spinach, cheese & pecans, etc – all foods you can get at the grocery store and/or make at home. 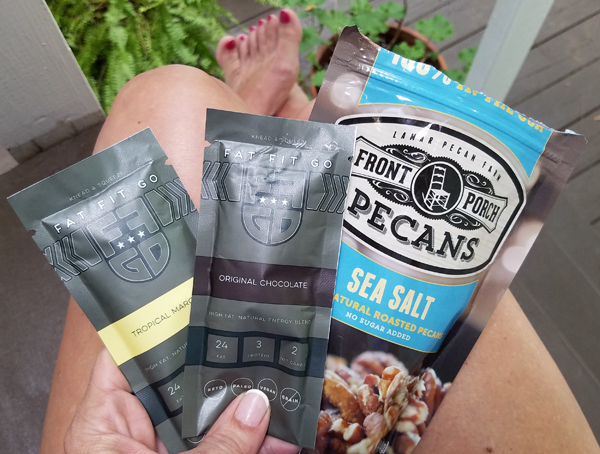 I do review a lot of foods (by request) so those end up in my food diaries – because leaving them out would be deceptive, if I didn’t include them in my macros. 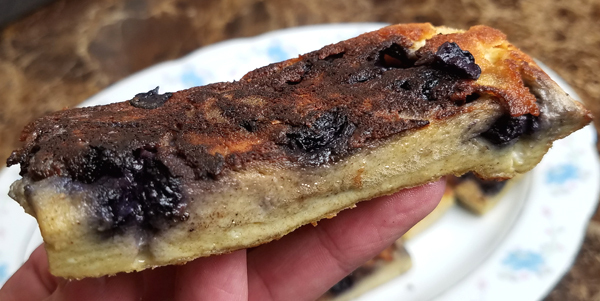 But I never pressure anyone into buying anything, I suggest alternatives – like skillet pizza instead of cauliflower crust, or regular almond butter and your own blueberries instead of the blueberry almond/cashew butter you can order, etc. It’s simply options, and I like to share what I do like as well as what I do NOT like, and really enjoy the feedback & discussions from others on both (likes/dislikes) as well. Anyway, I hope my simple meals give you some ideas for meals you can make, or restaurant meals you can order – or grab on the way home on busy days. Most of those can easily be made at home too of course. But someone has to check this stuff out and see! Otherwise, as you pointed out, it could get expensive to find out for yourself. That was the case for me when I first started, so I like helping people avoid that. I am just starting and can’t figure out how to figure the Mic is, fat, protein, calories for me. I have gone to several spikes but can’t seem to understand how to start from beginning .Can you suggest an Easy app. or something. Thank you !